Redesign of existing display into modules. Or ... One family, many parts. Italian consumer products company was shipping assembled retail displays 6 feet tall X 2 feet wide X 2 feet Deep from Europe to the U.S. to support their North American business. Half of the these displays were broken during shipment. This resulted in ridiculous excess transportation and display costs, and many upset customers in the U.S.
APS redesigned the existing display from one large unwieldy monolithic unit into multiple plug compatible modules. The modules are easily packaged and shipped via UPS regular ground service from our factory in Ann Arbor, Michigan. Product shipment damage is non-existent. 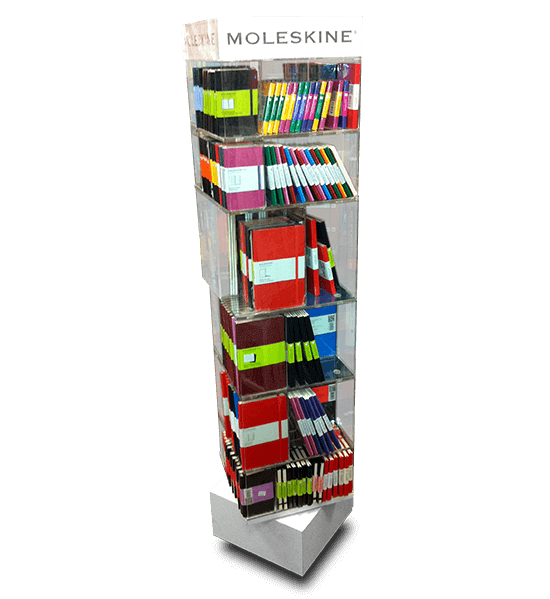 During normal in-store usage, if a display is knocked over and damaged, a replacement module can be provided quickly and inexpensively from existing warehouse stock. Further, the modular design eliminates display obsolescence. New modules are constantly designed to display new products. To date we have produced 40 different displays in this family and the number is still growing. All modules are compatible with all existing displays. This solution provides our customer/partner with value and continuity for their entire product line and substantially reduced transportation costs.